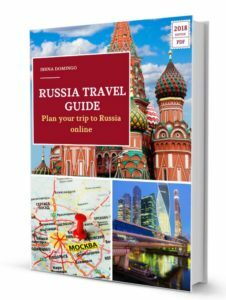 In this article I have tried to gather the most important aspects in regards to safety, health, money, customs regulations and rules of behavior when traveling to Russia. In general, Russia is a safe country, especially if you’re traveling as a tourist to big cities like Moscow or St. Petersburg, or you’re going to do the Trans-Siberian route. Is it possible to pay with dollars in Russia? Can I get into a Russian Orthodox Church in shorts? In general, Russia is a safe country, especially if you’re traveling as a tourist to large cities (such as Moscow, St. Petersburg, Vladivostok, etc.) or if you are making the Trans-Siberian route. The border with Ukraine. You should avoid travelling to the east of Ukraine and to the territories of the self-proclaimed republics of Donetsk and Lugansk. These are armed conflict areas. North Caucasus. The North Caucasus region is still an unstable and potentially dangerous area. Specifically, Dagestan, Ingushetia, Kabardino-Balkaria, Karachayevo-Cherkessia, North Ossetia and Chechnya. Abkhazia and South Ossetia. 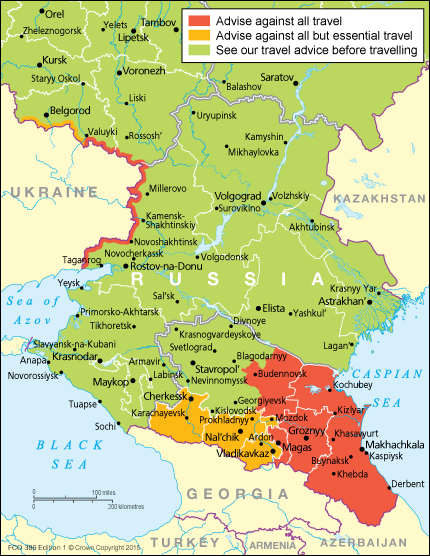 The republics of Abkhazia and South Ossetia have their self-proclaimed militarized borders with the Republic of Georgia, which prohibits the entry into its territory from these republics that considers as illegally occupied. The streets of Moscow or St. Petersburg are as safe (or as dangerous) as the streets of New York, London, Paris, Rome or Madrid. Perhaps during the decade of the 90s, after the disintegration of the Soviet Union, Russia itself was a troubled country for security, but today this has totally changed. In Russian cities there usually are many policemen around, especially in the center, which gives a feeling of greater security. The behavior of urban police and traffic is usually polite but quite brusque. Today is not very common to find police request documentation to foreign tourists, trying to find some stick to it to impose a fine. 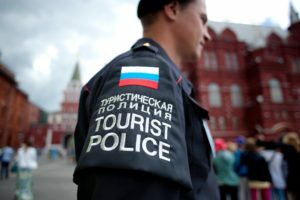 It should also be noted that since July 1, 2014 it was launched the tourist police in Moscow, an initiative of the local authorities to improve the image of the city, aimed to provide support to foreign tourists in the Russian capital. It consists of special security patrols and information in English for foreign tourists visiting the city. Currently they make up about 200 policemen. 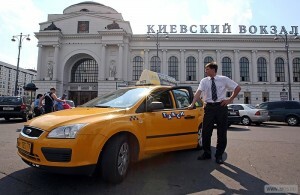 Without being something general, and as in many other developed countries, thefts occur in large Russian cities, which often are aimed at foreign tourists. In any case, the center of the big cities is very safe because there are lots of police patrolling tourist areas, shopping centers, etc. Foreigners are the preferred target by “petty” criminals: pickpocketing, bag theft, etc. Violent crime, however, tend to be directed not against foreign tourists but against the “new Russians”, representatives of the oligarchy with fortunes of more than questionable origin accumulated in recent years. Regarding terrorist acts, we can say that at present neither Russia nor any country in the world are safe from possible terrorist acts. Pay special attention to your personal belongings, especially in crowded places (like the Metro). Avoid traveling to outlying areas away from the center of the city, especially at night. If a policeman stops you to impose you any fine for no apparent reason and you think you have not committed any offense, it is best to call your Consulate or Embassy. Always carry your passport with visa and immigration card. They must be original, not photocopies. Passport. It must be in perfect condition with the caps attached to the book, not missing any page, and must not be damaged. Local authorities are very strict in this regard, including concerns with the passport photograph. Failu re to comply with any of these conditions can cause problems when trying to enter and / or leave the country, a fine, or rejection at the border. Visa. It comes attached to one of the pages of the passport. It should be checked in advance that all visa data is correct. Immigration card. 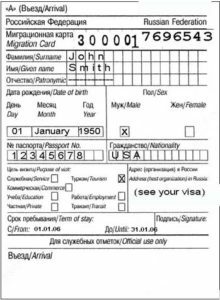 At the time of entry into Russia, all foreigners must fill out the immigration card, though at major airports this goes along also by immigration service process, either manua lly or in digital format, depending on the airport. In smaller airports (provincial), it’s more common for the traveler to fill out the card, so you have to take a good look and fill it properly to avoid problems later. The card consists of two equal parts, the size of a passport page. One part stays with the border police and the other is given to the traveler who must keep it until the departure from the Russian Federation. The immigration card is also needed for internal displacement in Russia, as well as for registration. In case of loss of the immigration card, you must notify, within three days, the local immigration authorities so they can issue you a duplicate, once you have presented documents proving your entry into Russia. Proof of registration. When a tourist arrives to a Russian city, the hotel or accommodation must register it before the immigration authorities, issuing a proof thereof. According to a new legislation which came into force in March 2011, the police can’t fine in the streets those foreigners who don’t have up to date their immigration registration papers. It is the inviting party (the hotel or apartment host) the responsible for any infringement that has occurred. The hotel will need to have your passport and immigration card for about 24 hours to complete the registration. It would be convenient to ensure that the registration is made effective and carry the proof of registration, just in case. When traveling through Russia, either on foot, by public transport, by car or plane, there are a number of aspects to consider. Walking. Caution should be exercised when crossing streets on foot, even on zebra crossings, since prudence and education is not the strong point of Russian drivers. Note that in Moscow the streets are very wide so it is very common that there are underpasses for pedestrians to cross them. Taxis. Any car in the street car is potential taxi (particular, official, an ambulance or a hearse). 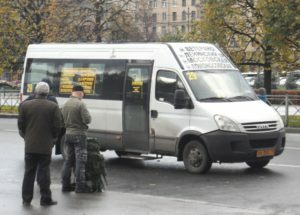 If you put out your hand anywhere in Moscow, these makeshift taxis will take you to your destination with which you can negotiate the rate previously. It is always advisable to avoid using these illegal taxis, especially at night. They are supposed to be cheaper but they can sometimes charge higher than legal taxis. It is always advisable to ask the hotel to call a taxi driver or a taxi company. Another good option is to book it online with some well-known company (for example, KiwiTaxi). Train. Russian trains are the safest in the world. There is only one reviewer (provodny or provodnitsa) in each of the cars that ensures cleanliness and order but police patrols also travel there. Travelling by night train from Moscow to St. Petersburg or do the Trans-Siberian route is absolutely secure. That said, you must take certain precautions when traveling by train (not only in Russia but in any country). It is always advisable to keep your valuables in the compartment under the bed or seat. When leaving the compartment never leave valuables, though some compartments are lockable to prevent theft. Airplane. If you’re going to take a plane in Russia on a domestic route, I recommend booking the flights of any Russian international company such as Aeroflot Russian Airlines o S7 Airlines, since there are many small flight companies with very old aircraft fleets, and there’s also the relaxation in safety standards in recent years of many of these companies (many with financial problems). 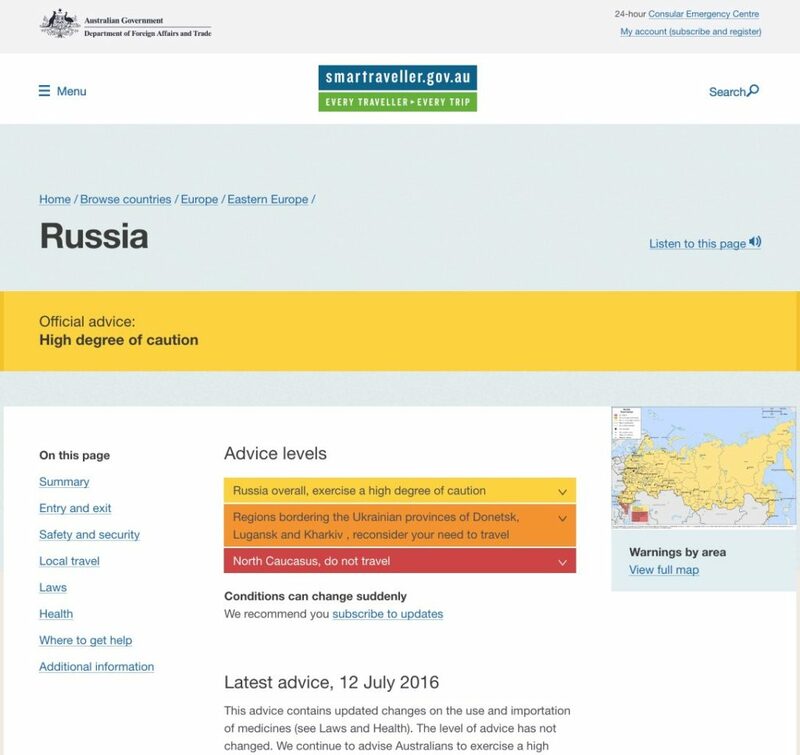 According to some experts, the risk of traveling by plane through the interior of Russia is 10 times higher than in European, American or Australian travel companies. Car. I would not recommend using a car to travel by Russia, unless it is strictly necessary. The roads leading from Moscow to certain airports and several nearby resorts are in good condition, but overall conservation is pretty bad, because of the harsh climate, abandonment and lack of maintenance. The government wants to improve their status for the next World Cup in 2018 but the task ahead is daunting. The roads outside major cities are usually in poor condition. The speed limit on the road is 60 km / h, outside urban areas 90 km / h and 100 km / h on motorways. Road safety is poor. According to statistics published by the Russian government, there were nearly 200,000 traffic accidents in Russia in 2014, causing more than 26,000 deaths and more than 250,000 injured. Metro. It is a means of safe and rapid transport (except when there were terrorist attacks in 2004 and 2010), though don’t expect much comfort, especially during peak hours (7 to 10 am and 16 to 19 hours). Except in the city centre, the network of stations is not very thick, so sometimes it must be combined with surface transport. It is also desirable to have a minimum knowledge of the Russian alphabet, since the signs in the stations are only in cyrillic (though the planes of the stations and the trains themselves also contain the names in Latin alphabet). Bus, trolley and tram. Buses, trolleys and trams have mostly an old and outdated look. While there are not usually serious incidents, they get faulty often. It is important to know that they stop at all stops, without the passenger’s request. Marshrutka. These are shared taxis or minibuses that often tend to be faster and cheaper than regular buses. Usually they perform routes where there is no railway line or they are slow. Drivers are usually from countries of the former USSR republics and many of them drive in a rampant and somewhat dangerous manner. Many of these marshutkas do not always meet the minimum safety requirements, such as wearing seat belts in every seat. Ship. When you use the ship to move between Russian cities (eg between St. Petersburg and Moscow), it is advisable to use recognized cruise operators and with implemented security measures. Tourist boat rides by Moscow or St. Petersburg channels are safe. In crowded places, such as the Metro, it’s always a must to go holding hands. Subway stations are not equipped with elevators to go down with carriage, so you have to be careful when going down the stairs. It is advisable to bring your own passport and visa to avoid potential problems in and out of Russia. To travel to Russia it is essential to have the mandatory health insurance. It is always advisable that such insurance offers the best medical coverage as possible, to deal with any contingency, including medical repatriation, if needed. Clearly, if you’re traveling it is best not to fall ill or need medical care, but if it is the case, you better happen to be in any other country other than Russia. I say this because the Russian health system is poor. Most public hospitals are in very poor condition. Many of them do not even meet the minimum hygienic conditions. It is estimated that only 20% of the Russian population has access to quality medical services. Private clinics (and some public) are in fair condition, though they are very expensive, especially when it comes to foreign customers. In case of emergency you can call 112 (in Russian and English 24 hours a day) from any phone, including those without SIM card, or are blocked or out of balance. In case of a medical emergency or accident, you can contact the Embassy and Consulate to help you contact your family and with the health insurance company. Regarding the possible spread of diseases, though there have been some cases of bird flu and A H1N1 type influenza, at present there are no restrictions. However, before the trip you can visit WHO website. According to Russian authorities, there are no problems to find medicines, though they recommend that travelers who are taking medication or that need them permanently (for example, people who suffer from heart or circulatory system diseases, those that require daily insulin intake, etc.) must carry enough prescriptions with them to cover their stay period in Russia. In this sense, you must take into account that in June 2016 a new law requires travelers who are bringing their own medicines to Russia to have a recipe with the traveler’s name, the name of the drug and the prescribed amount. If the recipe is not in Russian, then a notarized translation is required. Some medications that can be bought over the counter in other countries may require a prescription in Russia. For more information it is best to check with the consulate or the Russian embassy. In the case of chronic diseases in which a large amount of drugs is needed and it is not possible to bring so much to Russia, it is always advisable to have the prescription and medical report in which the active ingredient and the generic name is pointed out so you can easily get them in Russian pharmacies. Moscow is a city with a lot of pollution, due to the large amount of traffic and polluting cars and old buses, among other things. Air quality in Moscow may worsen in certain weather conditions. The best way to know is through the local press or through the website of the Ministry of Emergencies (Russian) for more information. Water in large cities, though in theory it is drinkable, it is always better not to drink it. It is advisable to buy bottled drinks. In St. Petersburg water is not potable, and in Moscow it leaves a residue when boiled. Moscow and other Russian cities have banned smoking in public places such as museums, theaters, cinemas, exhibition and concert halls, hospitals, schools, universities, public transportation, Metro, bars and restaurants, hotels, government offices, etc. Smoking in playgrounds may result in a fine of 2,000 to 3,000 rubles, while doing so in other public areas carries a fine of between 500 and 1,500 rubles. It should also be noted that it is illegal to drink alcohol around schools, universities, medical centers, etc. It is also not allowed to drink alcohol in public places (such as parks, gardens, train stations, bus stops, pedestrian zones, etc.). Doing so can result in a fine of 500 to 1,500 rubles. It is also illegal to appear in public under the influence of alcohol and have an offensive attitude towards other people. It can lead to a fine of 500 to 1,500 rubles or detention up to 15 days. Prostitution is illegal in Russia. Of course, the manufacture, use, sale or distribution of drugs is prohibited. In this sense Russian legislation is very strict, with very severe prison sentences. The Russian Ruble was released freely in the foreign exchange market in November 2014. Since then it has shown a lot of volatility with a clear trend towards devaluation, which means that for tourists who change dollars for rubles, the trip will end up being more economic. 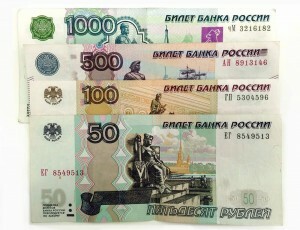 The ruble has fluctuated between 50 and 100 rubles / US dollars in a few months. However, keep in mind that this strong devaluation has also led to a sharp increase in prices in the country, which in 2015 rose 13%. Once in Russia, the cheaper and safer way to change currency is to use your credit card for the major purchases. For those sites that don’t accept credit card, use rubles, which you can change at any Russian bank or with your card through ATMs of Russian financial entities. Never change rubles with street vendors. As for the use of cash, the first thing to know is that there is no limit for the entry and exit of foreign exchange in Russia, though it is mandatory to declare amounts higher than $ 10,000 (calculated as the sum of rubles, foreign currencies, traveler checks and other securities). The second thing to be clear is that it is illegal to pay with dollars or euros, regardless of whether they are accepted or not in shops or stores. It is never convenient to carry large sums of cash, either in rubles or dollars, to minimize the risk in case of theft. Use preferably credit card when making major purchases, rather than cash. In the case of carrying more than $ 10,000 to Russia, you must declare them at customs. In these cases you must ensure that the declaration form is sealed by a customs official to prove ownership of the money at the time of departure (in case you haven’t spent all during the trip). When making payments, it’s usually cheaper to pay by credit or debit card. Visa and Mastercard both often offer a good exchange rate (which is automatic upon purchase). Keep in mind that hotels, restaurants and most shops accept credit and debit cards. Inform your bank in advance that you’re traveling to Russia so they unblock the card during your trip. Banks usually have safety mechanisms that block the card against suspicious behavior. Making many purchases in a row for the first time in Russia can be interpreted as such. By air (in the case of individuals), the importation of products allowed for a value less than 10,000 euros provided they do not exceed 50 kg. By land and sea, the value of the goods may not exceed 1,500 euros or 50 Kg. The importation of products of animal origin by (cold cuts, cheese, ham, pâté or preserved product, among others, etc.) is permitted if they don’t exceed 5 kg and provided that they retain the factory packaging. As for fruits and vegetables, the Commission of the Customs Union (which belongs to the Russian Federation, Belarus, Armenia, Kazakhstan and Kyrgyzstan) has no specific restrictions for travelers. Caviar. 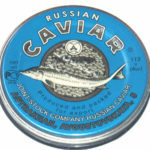 There are restrictions on the export of caviar, both black and red. In the case of black caviar, you must declare the export when the amount per person exceeds 250 grams. In t he case of red caviar, the obligation to declare is imposed from 5 kg. If you want to export a higher amount, it is necessary to have the appropriate license from the Ministry of Economy and Development of the Russian Federation. Antiques and art objects. You have to be careful when buying antiques and art objects, especially when it comes to religious objects (icons). There are important constraints to export these objects, as they have special protection, for which you must obtain permission from the Ministry of Culture of the Russian Federation. During the summer, in cities like Moscow or St. Petersburg, temperatures can be close to 40 degrees in summer, so you need to bring comfortable shoes and clothes for summer, and before packing and leaving home, see the weather predictions. There are plenty of websites where you can check weather forecasts or through multiple mobile applications. It should be noted that locals do not always have air conditioning, though they are very well equipped in terms of heating for the winter. In winter, ice sheets are produced in the street so slips are on the agenda. It is therefore advisable to wear shoes with nonslip soles. In buildings, heating systems are good, sometimes excessive, so it is preferable to wear clothes that you can detach easily when entering. Note that in all public places (theaters, museums, hotels, restaurants, etc.) there is a cloakroom, whose use is mandatory (not optional). The majority religion in Russia is Orthodox, practiced by 25% of the population. Approximately 15% of the population practices Islam. If you visit any Orthodox church (such as the Cathedral of Christ the Saviour) you have to pay attention to your outfit, since in some churches, to enter must you cover your legs and shoulders. Women must cover their hair and men remove their hats. The dress code is controlled at the entrance of some religious temples. For men: wear long pants (which can be uncomfortable in summer) and take off your hat or cap, if you have it. 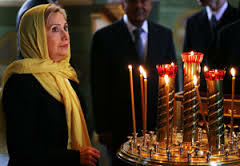 For women: Always wear a headscarf, because some churches require you to cover your hair. Use a shirt with sleeves or bring a sweater to wear when entering the cathedral. Beware of photographing military establishments or places of strategic importance (including airports), since it is prohibited. You could be arrested and interrogated. Aside from this, amateur photography is permitted in most public buildings and museums, though it is customary to pay a special entry fee if you are using professional equipment (tripod), otherwise, you can be apperceived or fined. In this respect, Russia is still very backward. While homosexuality in Russia is legal, there is still much intolerance among some sectors of the population, so it is advisable to be careful with public displays of affection. Since June 2013, a law entered in force that prohibits the promotion of “nontraditional sexual relations“, but the definition and scope established by the law is very vague. Foreigners convicted under this law can be arrested, fined and even deported. There are reports that cases of harassment, threats and acts of violence against the LGBT community have increased after the introduction of this law. What has been your experience, concerning security, on your trip to Russia? Have you had any problems?